July 2, 2014 ckeating Book News, eBook News, Speaking Engagements Comments Off on June…..
June has certainly been a month to remember. All the usual suspects: enjoying family and friends, working on a project or two and taking time to smell the roses. There is so much to be grateful for, ups and downs included. So let me tell you about what’s been going on with the book. 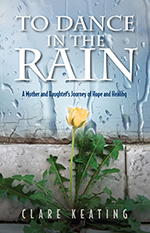 To Dance in the Rain – A Mother and Daughter’s Journey of Hope and Healing is now available in 5 bookstores. At the beginning of June To Dance in the Rain also became available for online purchase through Kindle, Nook, ibookstore, Goodreads, Kobo, Scribd, Barnes and Noble, Baker & Taylor, Flipkart, Copla, Gardiners, eSentral and Ciando. The book is very reasonably priced for ebook purchase. I have been very fortunate to have sold all but part of the last box of the original books printed. So, a few weeks back, after another thorough proofread, To Dance in the Rain went to second print. The books are presently on there way. So exciting!! Alicia and I had a wonderful time on Monday evening, spending it with the Aphasia Support Group that meets monthly at the Zion Lutheran Church in Waterbury. As we addressed the topic of Aphasia we covered: What is Aphasia? What are the causes, types and treatments? We also discussed treatment options, insurance issues and concerns as well as tips for family, friends and caregivers of individuals with aphasia. The history of Aphasia as well as the latest advances in stem cell and other types of research brought lively discussion. I would like to extend a very special thank you to Blanche Feero for asking me to come and speak with this wonderful group. What an enjoyable evening! !